Some readers may recall something of a discussion on these pages between myself and Larry Moran regarding the relative importance of natural selection and drift in phenotypic evolution. My refrain was "it's an empirical question", so I'll point to two recent reviews that touch on the growing body of data that can be used to address the question. The first is titled, conveniently enough, "Which evolutionary processes influence natural genetic variation for phenotypic traits?". The authors, of course, can't really answer the question, but they point to a number of studies examining specific traits and how natural selection has influenced their evolution. 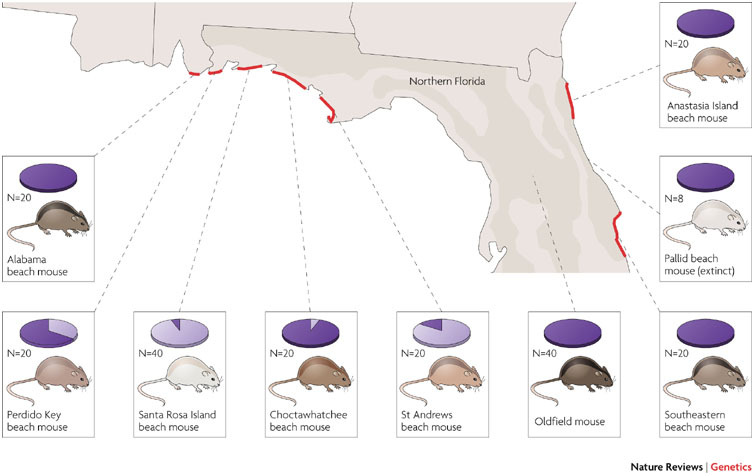 The picture is from a striking example of adaptive variation in coat color in mice. Another example that particularly caught my eye was that of variation in flower color in Linanthus. Those of you familiar with classic population genetics will recall that Linanthus was one of Sewall Wright's preferred examples of neutral phenotypic variation driven by isolation [pdf]. He was, as it turns out, probably wrong. Molecular data has the power to answer a lot of these questions, or at least allow them to be posed in a more testable manner. 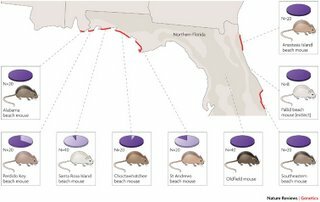 The second review focuses on the species that is becoming/has become the modern "model organism" for studies of selection-- humans. It's a very thorough summary of the recent scans for selection in the human genome, and anyone looking to get up to speed on the topic should read it. Selection in pervasive in the genome, and perhaps the only way to understand how it acts is through statistical analysis of genome sequence. The authors make this explicit, with an interesting nod to the oft-cited Lewontin and Gould spandrels paper. There are those who argue that functional evidence is essential for defining a region of the genome as being under selection, however, the deductive logic between selection and phenotype only goes in one direction-- that is, a region identified as being under selection using statistical methods is necessarily functional (with a certain false positive rate), but, as a modern fan of the spandrels paper might write, evidence of function does not necessarily imply selection. Human evolution has become something of a trendy topic, but as is often the case, it's trendy for a reason-- there is extensive data on genotype, phenotype, and environment coming available on our species, and this will allow us to tackle some of the longest standing debates in evolutionary biology. They are, after all, empirical questions.